Taofeek Owonikoko, MD, PhD, MSCR, is a Professor in the Department of Hematology and Medical Oncology at Emory University School of Medicine. A board-certified medical oncologist, Dr. Owonikoko specializes in the treatment of lung cancer, thyroid cancer and other cancers of the aerodigestive tract. He serves as Chair of the Lung and Aerodigestive Malignancies Working Group as well as Associate Director of the Hematology and Medical Oncology Fellowship Program in the Department of Hematology and Medical Oncology. Dr. Owonikoko is Co-Chair of the Head and Neck Working Group for the Radiation Research Program in the NCI/CTEP Division of Cancer Treatment and Diagnosis. Dr. Owonikoko's research interest is majorly in lung and thyroid cancer. He is particularly focused on the identification and clinical development of biomarkers and new treatment approaches to improve the standard of care for lung and thyroid cancer patients. 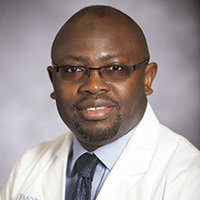 Dr. Owonikoko's full bio can be seen here: https://winshipcancer.emory.edu/bios/faculty/owonikoko-taofeek.html.